Does your character have a life beyond killing monsters and taking their stuff? Probably yes. But is there anything on the character sheet to actually reflect that life? Did you think to put dots into Sail to reflect that time your guy was shanghaied by pirates? What about grabbing the connections edge? Any crook as shady as you must have a few pals in the mob. Or how about throwing a skill rank or three into Profession (barrister)? Wasn’t your dwarf a “lawgiver” before his hold got ransacked by Tucker’s kobolds? 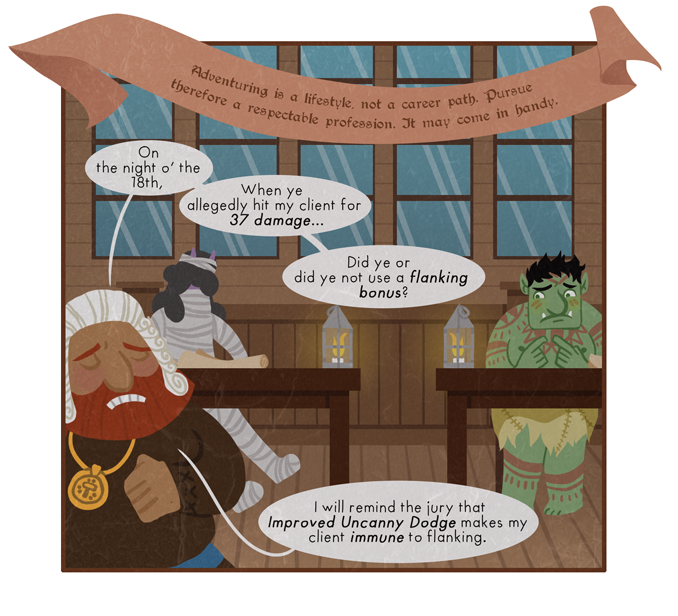 Here’s the thing though: There’s only so much sailing, talking to wise guys, and dwarven litigating that’s likely to happen over the course of the average campaign. If your precious resources wind up going towards these things, you’re going to have fewer abilities that say “hit monster harder” or “die slightly less.” Since those are the sorts of abilities most likely to come up in every session, it gets kind of tough to justify the well-rounded character sheet. 5e D&D did a masterful job giving players backgrounds for free. Sure they’re only minor abilities, but they’re also a step in the direction of fully realized characters. Same deal with background skills in Pathfinder Unchained. They managed to uncouple the “flavor” skills like Craft, Knowledge, and Profession from the more generally useful stuff like Perception and Stealth. But while systems can try and tackle this question, I think it ultimately comes down to players. Questions of the day then: How do you personally choose between the powerful character ability and the flavorful one? 5e makes it even easier than with just backgrounds; all classes are designed with “Ribbon” abilities, aka class features that add more flavor than power. For example, Battlemaster Fighters get a free tool proficiency and the ability to read a person’s combat strength after observing them for a minute (far too long to actually be used in combat.) Rogues get Thieves Cant, which opens up a whole world of Rogue-specific contacts for even non-Criminal Rogues. That sort of thing. Still, I always make sure my characters have at least one or two non-combat shticks. A good social skill and a good exploration skill can round out a character nicely; my street urchin Rogue, for example, had good social skills and a Familiar for scouting (and helping with the social skills). You know me. I love the 5e familiar. I try to put one skill into a profession on a level 1 to show what he was before the adventure started, but we usually don’t use those skills. Which makes good use of ranks put into some skills. Thanks in part to me playing Pathfinder Societies, I consider my characters to have certain skill responsibilities. If I play a divine caster, I see it as my responsibility to take ranks in Knowledge Religion, as I’m the one who’s most likely have access to this. Rogue? Disable Device, since it’s practically the identity of the class and arguably one of the reasons it even exists. Wizard? Spellcraft and Knowledge Arcana. I’ve already brought up how Diplomacy and Perception are “content gates” that can stall out an entire adventure if the party doesn’t have them. Once I get my responsibilities out of the way, I see what I can do with spare points for flavor’s sake. In a best case scenario, there’s a certain synergy. My pirate has Profession Sailor, for example, and I try to play her in scenarios where that matters. My Gnome Summoner focuses on Craft Painting because I imagine her Eidolon as a living watercolor work come to life. Things like this are why low skill classes feel frustrating to the point of being near unplayable to me, even if they’re objectively strong in every other way, like the Cleric. I gather that Pathfinder Societies hasn’t adopted the background skills system. Would you implement that fix in a home game? PFS only took on the Unchained classes. (Hell, Un-Summoner is now mandatory) As far as I’m concerned, Background Skills fixes one of my biggest problems with the system and the 3.5 Baggage that weighs it down. I have a few home game ideas in the works, and they’ll all have BG Skills involved, but one of them will revolve around them. It’ll be based on Dwarf Fortress (imagine a cross between the Sims, Oregon Trail, and Prison Architect) with the all-Dwarf party set out in the untamed wilds with nothing but their productive skills and whatever they could fit on the Wagon. It would then play out like a smaller-scaled Kingmaker where they dig into the mountain and build an outpost, taking in migrants and developing their own infrastructure. Suddenly that Craft: Barrel Making is pretty damn important when you have nowhere to store your precious, precious alcohol. While I hate to do so, when presented with the binary choice of “powerful ability” or “flavorful” I pretty much always pick the former. I just understand the impact it has on the mechanical aspects of the game to much to justify doing otherwise to myself as much as I’d love to just focus on the flavor. A key issue is that I understand I can just…make up flavor stuff. Sure the game mechanics won’t support me and in some games there’s little chance of convincing the GM to just roll with it, but there’s always stuff you can do that’s outside the rules for flavor but on the other hand doing stuff outside the rules for in game power is just cheating. As such given the dual nature of roleplaying games (of this sort), the setup incentivizes you to choose power over flavor since one is a limited resource and the other isn’t. I do agree 5E makes me happy because of Backgrounds and “Ribbons”. Wish they focused a bit more on stuff like that though. Not at the expense of the combat or important adventuring skills, just in addition. But it *is* a fine line. If they do too much it becomes GMs telling players they can’t do flavor stuff because they don’t have the required thing. It doesn’t matter that that required thing would require them to have five levels in a class that doesn’t work at all well with the class they actually care about, non-expert level GMs will obsessive stick to the rules and assume you can’t do anything of a sort the rules allow you to do if you don’t have that thing. That said, I’m not a complete munchking/powergamer type. I’ll often still make a tiny sacrifice of raw power for the sake of the character. Sometimes more if the character concept just doesn’t fit the most efficient way of doing things. This mostly comes across in skill proficiency choices. The classic example of fighter/barbarian types just sucking it up and taking proficiency in Intimidation even though Charisma is (one of?) their dump stat(s) because it’s absurdly against their concept to not have it. It still stings a bit to know the 100 pound half-elf bard who spends his days writing poems about dandelions is mechanically scarier than your hulking goliath in plate armor who isn’t allowed to enter taverns because he might break the door frame and then the floorboards simply by walking inside. I hear you on the “I can just make up flavorful stuff” argument, but one of my favorite things in gaming is watching aspects of a character reflected mechanically. In Pathfinder for example, it’s one thing to RP an impoverished noble, but it’s another to take the (admittedly awful) lost nobility trait. There’s something about that concept of reflecting story with rules that I just love. Of course, that’s just a preference in general terms. In practice I’ll find myself splitting the difference, taking enough mechanically sound options to “stay viable” (read: be at about the same power level as the rest of the party) while taking the flavor stuff where I can. It works out to a 50/50 split most of the time. I generally build with the mindset of ‘The character sheet is for the crunch, the actual roleplay is for the fluff,’ but every so often I’ll find a feat that isn’t TEH BESTEST mechanically but just makes so much sense to have that it’s painful to leave it alone. When I come across that, I build around it, heavy crunch with the fluff centerpiece. And when the DM takes the centerpiece one day and makes your survival depend on it, how sweet a feeling it is. Ima need an example. What feats do this for you? I remember one wizard I made that ran with Alchemical Affinity. You get some bonuses when you use spells that are on the Alchemist and Wizard list both, and you can plunder alchemy labs for spells. It comes up…not as often as, say, Improved Initiative. But the crankpot inventormage that waddled around on my behalf (I guess like Belle’s dad in Beauty and the Beast?) made it the focal point of his entire lifestyle, which provided some great benefits and occasionally drawbacks when an alchemist guild decided that their secrets needed to be defended more vicariously. I am continually amazed by the number of feats I don’t know about. Sounds like a fun character. I play a lot of Fragged Empire lately. It’s a scifi game that gets this right by a mile. The stats for roleplay and combat are seperate. The skills are split. So when you get trained, you choose six “personal” skills and four “combat” skills. Thus way you aren’t tempted to disregard “talk to people like a sane person” in favor of two more points in “blow their head off easier”. You talked about crafting awhile back, and I think it’s one of those things that would really do better as a background than trying to shoehorn it into regular gameplay. Because what you make helps you in combat, but what DO is always out of combat. Maybe 1 class, like the artificer, who can do stuff like in-combat crafting as their gimmick, but for everyone else a separate system. Have you ever read the webcomic Girl Genius? That seems to do in-combat crafting decently from a story perspective, and what I’d use as inspiration for trying to make it fit in game. Anything you build on the fly is highly prone to backfiring, and even if it works it falls apart quickly. For everything else, rather than using up such resources as XP, gold, or feats, I’d prefer to base it on time and maybe roleplay. It depends upon what resources the character has available to spend, how plentiful they are, and how much need he has of all of them. If it’s a skill I’m looking at to flesh out my character, and I don’t need all of my skill points for my current build to function, spending a few skill points (or even maxing the skill out, in a simpler build) isn’t a big deal. For example, two of my characters in a multi-party campaign are co-authors of semi-autobiographical books based upon the parties’ adventures. One has a few ranks in Perform (Oratory) and the other has a few ranks in Profession (Scribe). Neither character could spare more than the few skill points I allocated for the skills, but both characters are spellcasters, and rely on skill buffs and Taking 10 in order to produce their literature. Another character is writing an in-universe Monster Manual, and has Profession (Artist) maxed out for producing the illustrations. His build was a bit simpler, and I could afford to spend the skill points to make him legitimately good at the skill. However, I’m unlikely to spend precious feats on, for example, a Skill Focus that doesn’t qualify me for a feat or prestige class I want for the character. It’s just not worth the expenditure of something so limited in number and so necessary in order to make the build function. As a writer, I would love to be able to rely on spell buffs to produce literature. Just zap myself with inspiration, pound keys for half an hour until the spell wears out, and then call it a day. IRL I’ve got to make do with coffee. Objection! Your Honor, Cleric is clearly leading the witness here. As a GM, I’ll allow it.